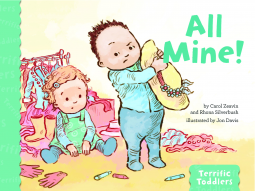 An excellent resource for those with toddlers: All Mine! by Zeavin and Silverbush – Joyce's mystery and fiction book reviews with some non-fiction too! This read-aloud/picture book is published under the auspices of the American Psychological Association. It is cheerfully illustrated with a diverse group of toddlers who do not want to share. A calm and lovely teacher repeatedly intervenes to help by respecting the child who does not feel ready to part with something and by offering the other child an alternative. The repetition will be helpful for young readers and will remind parents of the need for patience when coping with young children. At the end of the book, there is a VERY helpful guide for parents. Believe it or not, there is even a little spoiler there that you will discover for yourself. Highly recommended for toddlers and their caregivers.